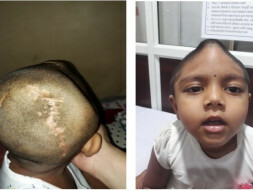 Help for my Little Angel, Ishita. I am Supriya, Ishita's aunt. Her father works as a driver for school children & her mother is a house wife..
My 4 years old niece Ishita met with a road accident and had to undergo multiple brain / skull surgeries. Her 2 lobes of the skull had to be removed due to swelling of the brain. She is currently undergoing treatment at Bharati Hospital, Katraj, Pune and needs approx Rs.13,00,000 (INR thirteen lakhs) to operate and replace the removed skull with Stryker Medpore Custom Implants. We are trying very hard to gather as much fund as possible. Your small help can make a lot of difference in how my girl will live for the rest of her life. Thank you all for your supporters. Ishita's operation has been scheduled on Monday. As of now, she has been undergoing physiotherapy at home. 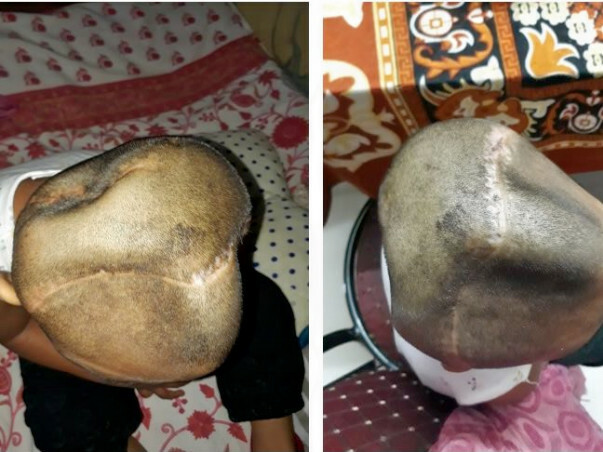 Doctors have suggested that they will perform her skull surgery once they get all the remaining parts from USA. It will be a critical surgery for them. Thank you for your overwhelming support. Ishita will be operated in another 10-12 days. She will undergo a scan tomorrow, post which, the reports and the CD will be sent to one of the doctors in the United States who will be suggesting the future course of action. She has been eating normally, like other kids of her age. Currently, there no restrictions in her diet. We take her to a playhouse regularly where she meets new kids. She is cheerful and excited about making new friends every day. Also, her left side is paralyzed. So, we also take her for a physiotherapy session every day. There is considerable improvement in her arm movement. We really hope she gets better post her surgery. We are really thankful for all the support. Please do share this campaign further with your friends and family. Will keep you posted. I am extremely happy to share that Ishita will be soon going in for the surgery. 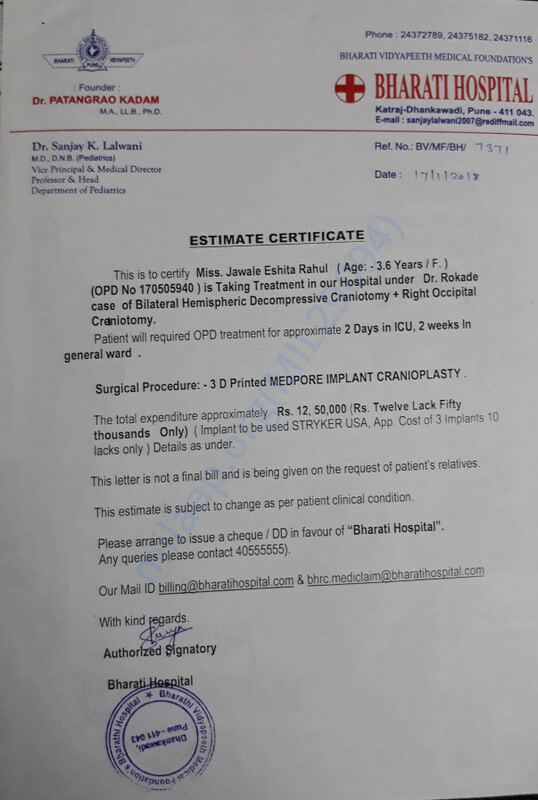 The required advance amount has been attained and now will be forwarded to Bharati Hospital in this week. Thanks to the efforts and support shown by the supporters. Thank you, each and every one who has helped me generate the fund. Without your help and generosity, this could not have been possible. Recover fast and have fun.